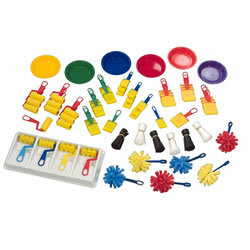 Let students' imagination soar as they dip and dab with our easy-to-clean sponge mitts, brushes, and roller sets. Products include class packs that contain letters, shapes, and animals. 3 years & up. These sponge sheets are great quality, highly resilient craft sponges that can be cut into any shape or object. After cutting a shape, just dip in water and watch the sponge expand. Craft sponges can be used for sponge painting on walls, making borders, designing t-shirts and more. 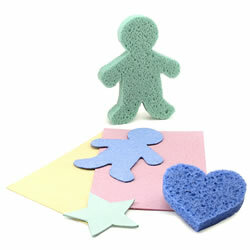 Sponge crafts are fun to do in addition to providing an excellent tactile tool for kids to play with. Sponge sheets measure 3" x 4" and come 4 to a pack. 3 years & up. 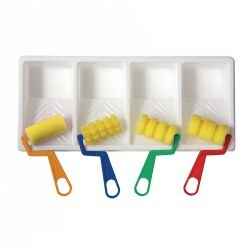 We've created the ideal assortment of sponge shapes for the classroom. Kid-friendly and great for art projects, these sponges are made from durable foam that is easy to clean and dries quickly. 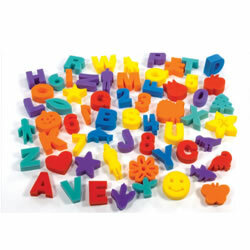 Kit contains a full set of letters, numbers, fun shapes, animals and children, a total of 60 in all. Made in the USA. 3 years & up. Vinyl painting mitts have a different texture fabric on each palm. Mitts are 7 1/2" with a securely fitting, elasticized wrist band and hanging tab for drying and storage. 3 years & up. 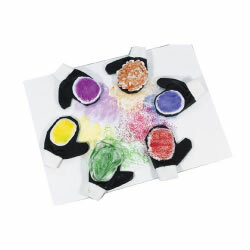 An assortment of four rollers, each with different patterns, are great for little artists to create unique paintings. 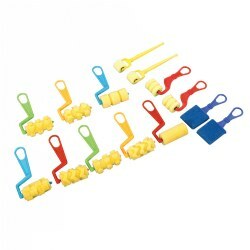 Durable foam brushes are easy to clean and have easy-to-grip handles with storage loops for hanging. Includes a tray with four wells to hold different colors of paint.